Transferring your purchased songs from iPhone to Mac doesn’t need to be a complicated process, but sometimes it’s necessary. For example, you may want to listen to your music across several devices, or maybe you just want to have an extra place to store your songs. Regardless, there are a few different ways that you can do this. Let’s take a look. Launch iTunes > Store > Authorize This Computer > Enter your Apple ID and password > Tap on Authorize button. Step 2: Connect your iPhone to Mac. Go to Files > Devices > Transfer Purchases from [Your Device Name]. You have to use iTunes, which some people don’t like because of its restrictions. You can only download your purchased music using this method. If you have music that you didn’t purchase, you can’t transfer it this way. All the purchases will be transferred. You can’t select purchased music, videos, audiobooks, etc to transfer. It will be complicated if your iPhone purchases were purchased within different Apple accout. You need to authorize this Mac for each one. If you don’t want to use iTunes, or if you don’t want to transfer all purchases, you can use a great transfer application to transfer your purchases. One such program is iMyFone TunesMate iPhone Transfer. It gives you a lot of freedom over your music, and you don’t even need to use iTunes at all to transfer your files. Selectively transfer both purchased files and files that you downloaded for free. Two-way transfer to transfer files between iPhone and computer/iTunes library. There’s no risk of overwriting your library when you sync your files. You can share your music with your friends, even if they have a different Apple ID. Restore iTunes purchases on PC, Mac, or iPhone/iPad/iPod with ease. Proved to be the perfect alternative to iTunes - Geekreply, tricksworldzz.com, etc. 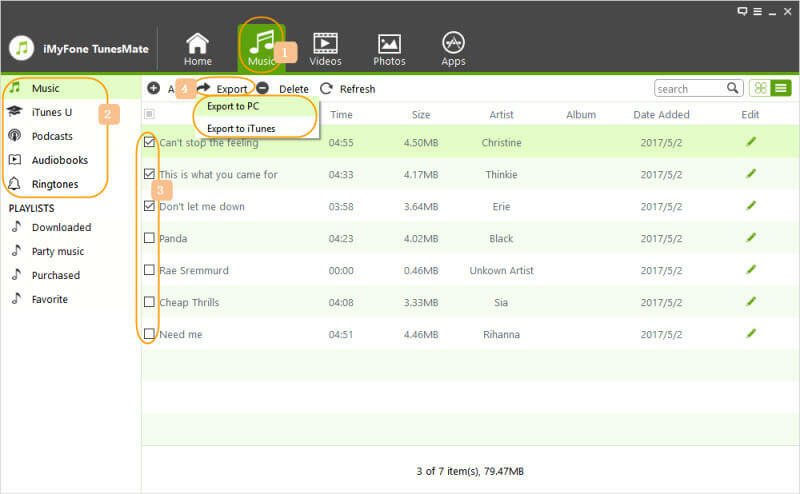 Using TunesMate makes transferring both purchased and non-purchased files (that you just downloaded from the Internet) simpler. Step 1: Download and install TunesMate onto your Mac. Connect your iPhone to your Mac, then launch TunesMate. Step 2: When the main screen comes up, click on the Music tab at the top. You will see a list of songs that are on your iPhone in the main part of the window. Select which songs you want to transfer. Step 3: At the top, click Export, then Export to Mac. Browse for where on your Mac you want to add the files, then click Select Folder. Or you can go to Export > Export to iTunes, which helps you to transfer music to your iTunes library. 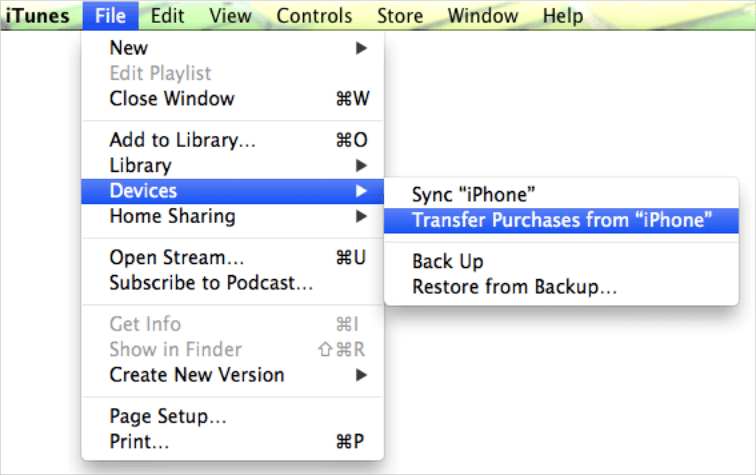 If you want to transfer all the purchases from iPhone to Mac at once, you can head to “Transfer iDevice Media to iTunes”. Not only can you transfer purchased files using this method, but you can also transfer any files that you’ve downloaded to your iPhone, iPod, or iPad. As you can see, TunesMate is very versatile and gives you a lot of freedoms that iTunes doesn’t have.